CYCLING: THERE were two podium finishes for two Solihull Cycling Club youngsters at the British Schools Cycling Association (BSCA) National Cyclo Cross Championships on Sunday. 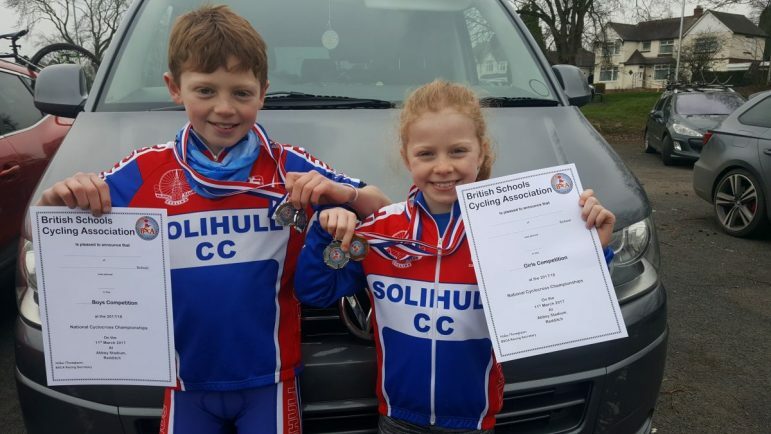 Holly Saunders and brother Max handled the warm but overcast conditions well in Redditch, with Holly finishing third in the Under-9s event and Max came runner-up in the Under-11 category. It was a long and technical course with 90 per cent of over undulating grass with lots of off-camber switch-backs and a couple of big climbs thrown in. After a positive start, Holly got herself well placed as the second highest girl and she soon settled into a good pace, managing to keep her concentration as the grass started to cut-up and the off-camber turns became increasingly slippery. There had been a bit of a pile up on the start line which had caused a few of the strongest riders to get caught up at the back of the field. It was inevitable that the Solihull rider would get caught however Holly still managed to hold out for an impressive third place. Brother Max had produced a solid display at the West Midlands Cyclo Cross League and he started on the front row at the start line. Like his sister, Maz got off to a good start and was nicely tucked into a trio of riders who darted away from the field. After a clean first lap and with Max looking calm in the small group, he decided to make a break and accelerated away into the lead. However, with a nice gap opening back to second place, his initial breakaway came to nothing when he hit a course marker and was thrown off his bike. Max was then passed by the second and third-placed riders and forced to chase he managed to overtake one on the last lap to take second spot. Solihull Cycling Club start their summer sessions for young riders on April 3 at Tudor Grange. If you are aged between 6 and 16 and would like to give cycling a go email ridercoordinator@solihullcc.org.uk.